This is paid content. It was written and produced by CBS Interactive's branded content studio in collaboration with the sponsor. Michelle Greene has been a fixture on the New York City art scene for decades. 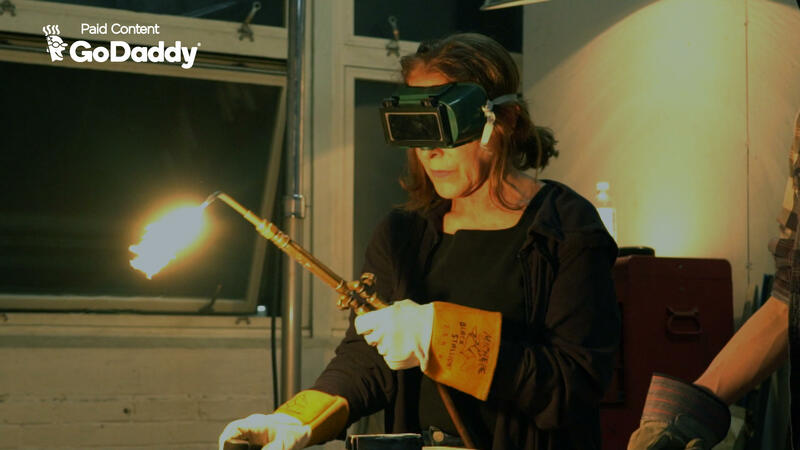 From her studio in the Brooklyn Navy Yard, she creates sculptures with what she describes as "industrial elegance." Most important to Greene is that her art becomes part of the community. "When we go into a gallery or a museum, we're taught not to touch anything," Greene says. "When I have my work in a public space, I want people to interact with it." Her best-known piece may be seen in the New York City subway, at the Columbia University stop on the 1 train. Called the "Railrider's Throne," it's an asymmetrical steel chair that incorporates shapes from the original tile work of the subterranean labyrinth. The throne was only supposed to stay in the subway for a year, but the community responded so positively that it now lives there indefinitely. "A lot of people look forward to sitting on it every day after work -- it's a highlight of their daily routine," explains Greene. "I can't imagine anything more satisfying for an artist than to see that." Greene's art also brings people together across the East River in the park she built for the Brooklyn Navy Yard. She transformed old doors from the ships that once docked there into tables and turned railroad tracks into bike racks, while benches made of glass and steel are an homage to the past and present. "I really love to repurpose things that would get thrown away, "Greene says. "I did that way before it was fashionable." Juxtaposition of contrasting elements is another key aspect of her artistic style, something she often references. The same idea seems to describe Greene herself. Small in stature and clad in classic New York black, it's at first hard to imagine her wielding a welding torch. But once you enter her Brooklyn studio she springs into action, operating industrial strength hydraulic lifts and pushing around massive metal sculptures with ease. Greene is a full-time artist, but she also wears other hats. She's a part-time associate professor at the Parsons School of Design and the The New School. Most recently, she has been teaching welding classes from her studio. Using her website as a marketing tool, she says providing new experiences keeps her current and engages a younger audience. "I get people that are just curious and never have done it," Green says while laughing. "And I get people that want to play with fire." Her work is in constant flux. Completed sculptures, years-old projects and materials she'll use one day, but for which she hasn't found a home yet, are scattered throughout her studio. Greene is now building a sculptural cabinet combining new steel with 100-year-old pebbled glass she found in the windows of nearby buildings. Yet another example of her blending the old with the new -- to get people talking, thinking and inspired. "I know that anything I can imagine, I can make," she says.